2017 Update: This is probably one of the most popular recipes I’ve ever posted; they’re easy to make, and people love them. 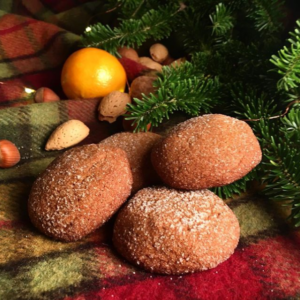 I’m not generally home in Peterborough in the months before Christmas any more, because I work on the Toronto Christmas Market, so I don’t get a chance to bake them with the fam, but we all love these Ginger Cookies. I know I say that each of my recipes is fabulous, but this one is really the jewel in my baking collection. Based on (or perhaps ripped off of) the famous ginger cookies at The Planet Bakery here in my hometown of Peterborough, this cookie is moist and delicious and perfectly addictive. They’re a Christmas tradition around our house, where I often make them to take to gatherings, meetings, and parties. Once you start eating them, it’s hard to stop. These keep really well for more than a few days, if they last so long, so long as you keep them sealed off from the air. This recipe is part of my Shaw Family Christmas Recipes series; you can find the rest of our annual cooking and baking traditions there. In a mixing bowl, cream together brown sugar, butter, and molasses. In a separate bowl sift together flour, baking soda, salt, ginger, cinnamon, and cloves. Add flour mixture to brown sugar mixture and mix thoroughly. Roll into approximately 1″ balls (these don’t have to be perfect – the cookies will flatten as they bake), and then roll balls in white sugar (Cassie and Sammi prefer to skip this step, but I like how sparkly they look). Bake at 375 degrees for 8-10 minutes on an ungreased cookie sheet. 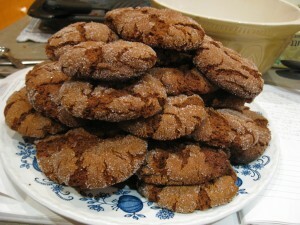 Each ginger cookie is about 100 calories.